:: in the online magazine Daniella Thompson on Brazil. Destruction in the name of progress. 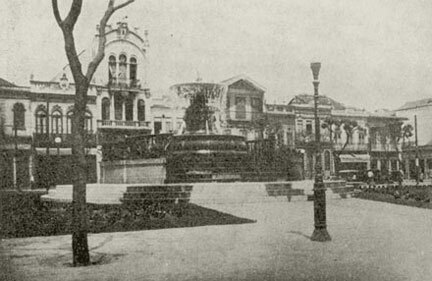 The last carnaval in Praça Onze took place in 1942. Even before the parade, most of the square had come under the wreckers ball to make way for the 12-lane Avenida Presidente Vargasa permanent scar on the face of Rio de Janeiro. 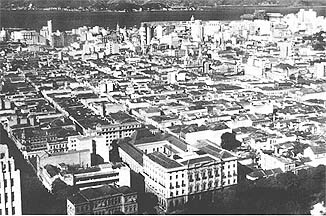 In his book As Escolas de Samba do Rio de Janeiro, Sérgio Cabral reports that at the beginning of 1942, all that was left of the square were the buildings on the external sides of ruas Senator Eusébio and Visconde de Itaúna, which were to front the new avenue. In the process, the city lost 525 buildings, including five churches, six banks, a market, and the Municipal Palace. 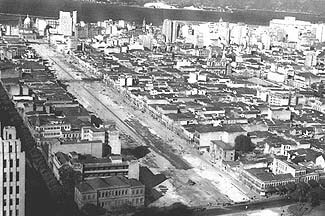 In preparation for the 1942 carnaval, the journalist A. Zul published in Jornal do Brasil a suggestion that the city pave the open area between Campo de Santana and Praça Onze that had not been appropriated for the avenue. His plea was ignored. The municipality ordered special decorations to be put up in the space formerly occupied by the square, alluding to its disappearance. The Vargas regime expected citizens to fall in line and support progress. Layabouts and dissenters were not tolerated. 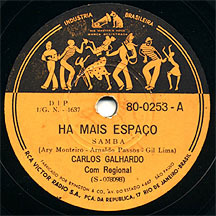 Nevertheless, Assis Valente came out with the samba Já que Está, Deixa Ficar, which celebrates the malandro (equated with sambista) way of life: Since its there, let it be. de Sinhô e de Noel, não é? Caso grave, abacaxi, não é? pra criar calo no pé, pois é.
Columbia 55291-A in August 1941. 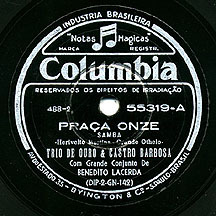 In late 1941, Herivelto Martins and Grande Otelo composed a samba that became not only a hit of the 1942 carnaval but the enduring hymn of Praça Onze. 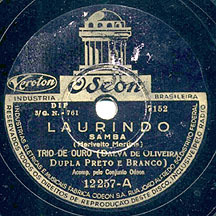 It inaugurated a chain of sambas about the square that would be recorded by Trio de Ouro (Dalva de Oliveira, Herivelto Martins & Nilo Chagas) during the 1940s, as well as rival song from other songwriters and performers. E o teu passado cantaremos. 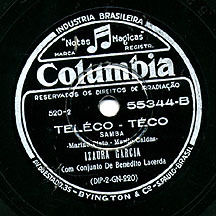 and released on Columbia 55319-A in January 1942. The success of Praça Onze couldnt remain unchallenged. The great sambista Geraldo Pereira answered the call with a more optimistic samba. Praça Onze is gone, concede the lyrics, but we, the escolas de samba, have a place to play, so we wont cry. Singer Moreira da Silva is listed as co-author, although the book Um Certo Geraldo Pereira records him as swearing to having had nothing to do with its creation. Por isso não vamos chorar. and released on Odeon 12252-B in January 1943. Not to be outdone, radio man Cristovão de Alencar and his songwriting partner Paulo Pinheiro jumped on the Praça Onze bandwagon with A Nova Aurora Raiou, striking another hopeful note for the future of samba. Yes, Praça Onze exists no more, the whole city was saddened, and even the tamborim cried. Yet the samba has to continue, and sambistas will begin a new life. The new dawn has risen, and joy has returned. This cheerful message was born by Ataulfo Alves and no doubt appealed to the censors at the Departamento de Imprensa e Propaganda. Note the DIP number on the label above the title in this disc and those that follow. on 29 December 1942 and released on Odeon 12261-B in February 1943. 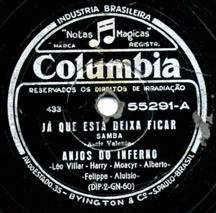 Herivelto Martins himself couldnt resist the temptation to fan the fire and produced another hit for the carnaval of 1943. Laurindo (borrowing a Noel Rosa character from Triste Cuíca) in turn pointed the way to several sambas by other composers that feature this fictitious personage without having anything to do with Praça Onze: Lá Vem Mangueira; Cabo Laurindo; Comício em Mangueira; and Conversa, Laurindo! (Herivelto would return to Laurindo the following year with the samba Quem Vem Descendo and in 1946 with Às Três da Manhã.) There was even a Laurinda. The pirâmide in the last line alludes to the war effort. Brazil entered WWII in 1942, and the populace was called upon to donate objects, chiefly of metal or rubber, for reuse by the military. These were placed in large piles (pyramids) in public places. In Laurindo we see the entire escola de samba leaving its drums on the ground in Praça Onze, helping the pyramid grow. Thus the loyalty to the lost cradle of samba is transformed into loyalty to the nation, a sentiment that was very much in line with the Vargas regimes expectations. and released on Odeon 12257-A in February 1943. 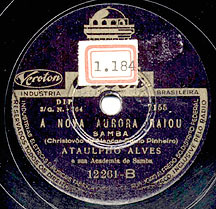 In 1942, Herivelto Martins also composed (with Cícero Nunes) the samba-choro Amélia na Praça Onze, a response to Ataulfo Alves hit Ai, Que Saudades da Amélia. The chafariz of the lyrics is the famous neoclassical fountain designed by Auguste Henry Victor Grandjean de Montigny. Praça Onzes centerpiece since the mid-19th century, it was relocated in 1943 to Alto da Boa Vista and is one of Rios officially designated landmarks. E passa fome em meu lugar. Foi a passar sem comer! and released on Victor 34921-B in May 1942.
on 27 April 1942 and released on Columbia 55344-B in May 1942. 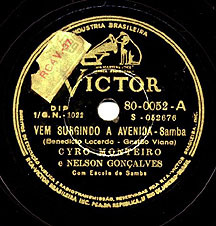 As Avenida Presidente Vargas was being constructed, the patriotic samba Vem Surgindo a Avenida came out, hewing very much to the official propaganda line. While the powerful drumming and the pastoras vocal backup come straight out of the terreiro, the lyrics offer a moral lesson Estado Novostyle: Praça Onze disappeared, but samba can be made anywhere. Our new avenue will be the pride of Brazils capital. The old square wont be forgotten, but we will all be better off without the disreputability that emanated from there. The former batuqueiros of Praça Onze have abandoned their dissolute ways and are now productive workers. 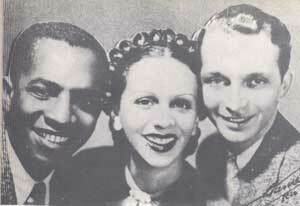 Both songwriters were linked to Pixinguinha, who had strong ties to the Praça Onze of Tia Ciata and Little Africa fame. 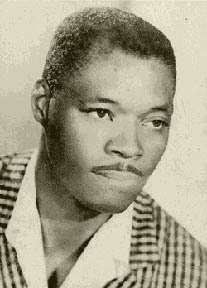 Gastão Vianna was the lyricist of Yaô, Bengelê, and several other distinctly African-flavored songs composed by Pixinguinha. 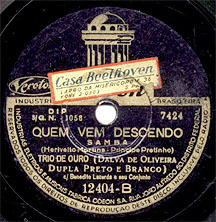 Benedito Lacerda, Pixinguinhas rival on the flute, would begin recording with the master in the mid-1940s. One cant imagine Pixinguinha penning a paean to the Vargas regime. Also interesting is the choice of singers. The sambista Ciro Monteiro is paired with the seresteiro Nelson Gonçalves, as if to suggest the povos universal approbation. on 14 December 1942 and released on Victor 80.0052-A in February 1943. Nem que seja depois de inaugurar! on 23 November 1943 and released on Odeon 12406-B in January 1944. 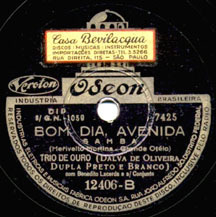 Recorded the same day and released in the same month as Bom Dia, Avenida, Quem Vem Descendo was yet another Herivelto Martins samba dealing with Praça Onze in which the figure of Laurindo returns. The censor tolerated the lamentations of Laurindo and his group as they mourn for the defunct Praça Onzeprobably because the musical tone is so upbeat. Once again, bronze is rhymed with Praça Onze, although here the bronze describes not a skin color but a trophy that Laurinso won for dancing samba in Praça Onze. Quem é que vem descendo o morro? on 23 November 1943 and released on Odeon 12404-B in January 1944. 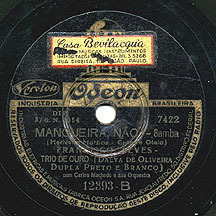 Herivelto Martins and Grande Otelo kept mining the eternally golden veins of Praça Onze and Mangueira for Heriveltos Trio de Ouro in the carnaval of 1944. In contrast with the submission affected in Bom Dia, Avenida, Mangueira, Não! is a vehicle for brandishing the banner of defiance. Here the destruction of the old city (including our square) is openly associated with the silencing of samba schools who had in Praça Onze their principal showcase. Francisco Alves injects pomp into his interpretations, reinforced by the full brass of the Carlos Machado orchestra. Note the inferior quality of the printing on wartime record labels. 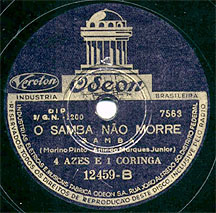 O Samba Não Morre could be interpreted as a song of defiance were it not so lighthearted. The lyrics dismiss not only the loss of Praça Onze but the transformation of Lapa. With some license they even suggest that favelas had disappeared. This bit of wishful thinking may have appealed to the Vargas regime, but in hindsight it is not only laughable but painful. But the song goes further, suggesting that even romance, moonlight, and guitars could cease to exist without vanquishing samba. If only life were this simple. on 11 May 1944 and released on Odeon 12459-B in July 1944. Ary Monteiro, Arnaldo Passos, and Newton Teixeira were shameless imitators. Is there a single original idea in Laurinda? The name is borrowed, as is the great sorrow at the demise of Praca Onze and the conviction that samba will survive. 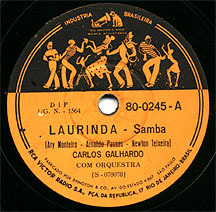 But unlike O Samba Não Morre, which dispenses with moonlight and guitars, Laurinda tells us that as long as there are moonlight and pandeiro, samba will live on. A nice touch is the final couplet: Our pride and vanity died, but not the samba that Laurindo described. and released on RCA Victor 80.0245-A in January 1945. The opening of Avenida Presidente Vargas inspired the samba Há Mais Espaço, rejoicing that there was now more room for the sambistas from the favelas to parade in the carnaval and threfore there are no reasons left for complaints. This tunnel-visioned (if not callous) song had no trouble passing through the DIP censorship. E a turma do morro sambou! 1944 and released on RCA Victor 80.0253-A in March 1945. My thanks go to the collector Dijalma M. Candido, who contributed recordings, label images, and lyrics. Copyright © 20032013 Daniella Thompson. All rights reserved.